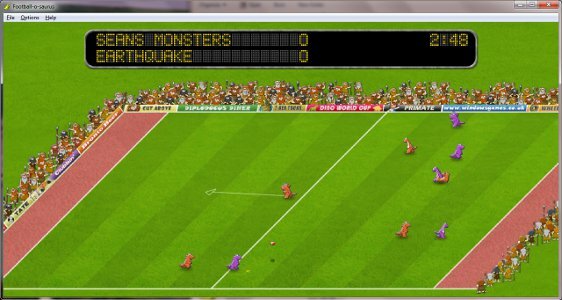 Football-o-saurus is a fast paced game of 5-a-side dinosaur football. You control your dinosaur by simply pointing where you want him to move to, and pass the ball by clicking on where you want to aim. The computer controlled dinosaurs are all very intelligent and will run into space when their team has the ball, and mark their opponents when they are defending so you have to put together a good move to score a goal. The game is networkable so up to 10 people can play against each other over a local network or the Internet.